Objects for video surveillance are most often located on the street and the distance to the server usually exceeds the critical 90-100m. To solve the problem of remote connection, optical communication lines are used. Access devices are used to connect IP cameras. It can be industrial media converters and switches with optical ports. 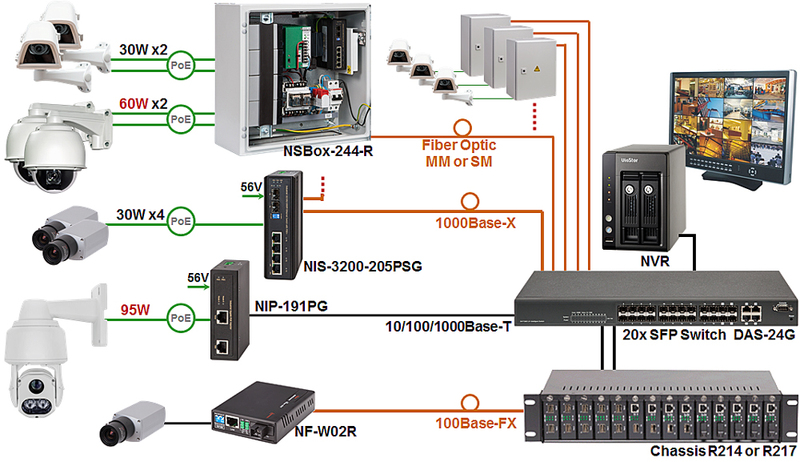 The best choice for such access devices is the use of Industrial Switches. The devices are designed for operation in harsh temperature conditions (-40 ~ 75°C) and over a wide range of supply voltages. The metal housing has IP30 protection and provides the possibility of DIN Rail or Wall mounting. The mean time between failures (MTBF) is about 200,000 hours and the warranty period is up to 5 years.